You use paper and paperboard products every day, from newspapers to food packaging to office paper. In fact, paper and paperboard products make up the largest portion of the municipal solid waste stream in the United States and as a result, offer the greatest opportunity to recycle. Learn more facts and figures and other details about paper recycling in the answers to frequent questions below. You might also want to learn about the basics of paper recycling. How much paper and paperboard is recycled every year? How much paper do we use in the United States each year? What can recovered paper be used for? Does all that recovered paper stay in the US? 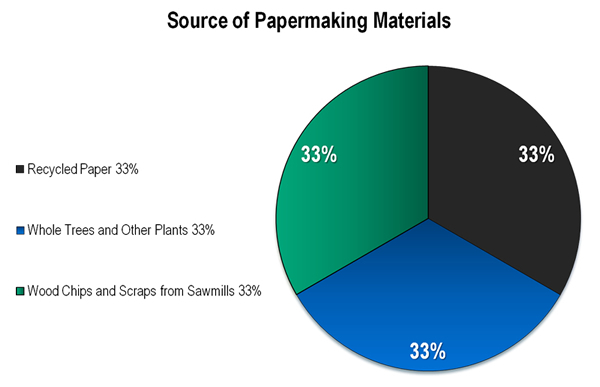 Where do the papermaking materials come from? Which states have the best access to recycling programs? Can a piece of paper be recycled indefinitely? What products can be made from recycled paper? Are staples, sticky notes and other materials okay to recycle? Find out at the Paper University. The prevalence of available recycling program varies across the country. Who invented paper and when? Ts'ai Lun in 105 AD. To find out more facts about paper visit Paper University. Are staples, sticky notes, and paper clips okay to recycle okay to recycle? Paper mills that process recovered paper are set up to remove common contaminants such as staples and paper clips from the pulped paper. Therefore, it is not necessary to remove such items before recycling the paper, although paper clips and binder clips can be removed and reused. If your recycling program accepts mixed paper, sticky notes are usually recyclable  but not always. Any mill that is able to process mixed paper can remove the adhesives found on sticky notes.